Synthetic & Bio-based Butadiene Market size was more than USD 16.5 billion in 2016 and will witness 5% growth over the projected timespan. Escalating tire and automotive industry across the globe is the major factor which is likely to stimulate the synthetic & bio-based butadiene market size by 2024. The rise in automotive industry is expected to drive product demand in automotive related industries including raw material for body parts, tires and other accessories which will subsequently boost synthetic & bio-based butadiene market size by 2024. SB rubber (E-SBR and S-SBR) and butadiene rubber are the major raw materials used in the production of tires across automotive industry as they possess various advantages including better grip and low rolling resistance which provides improved fuel economy and reduced carbon dioxide emissions. In terms of volume, global tire market is accounted for over 2.5 billion units in 2016 and is expected to reach approximately 3.90 billion units by 2024 attaining a CAGR of over 4% during the forecast period. In addition, the overall vehicle production in 2016 was approximately 90 million units. 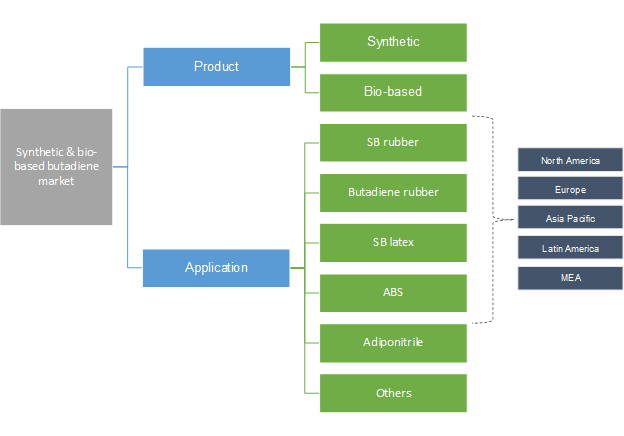 These factors will subsequently boost the synthetic & bio-based butadiene market as automotive and tire industry accounts for approximately more than half of the overall share in the industry. Rising demand for ABS (Acrylonitrile Butadiene Styrene) which has wide range of applications in automotive sector to produce automotive parts including sliding roof supports, air conditioning grates, etc. due to various advantages such as high impact & chemical resistance, heat stability, rigidity, and processing ease, makes it desirable in manufacturing automotive parts. Volatile raw material prices are likely to hamper the synthetic & bio-based butadiene market size, as these raw materials are petrochemical derivative. In addition, stringent government regulations for using toxic synthetic butadiene is expected to hinder the synthetic & bio-based butadiene market size by 2024. Synthetic led the overall industry by capturing a major chunk of the synthetic & bio-based butadiene market size in 2016. In terms of revenue, the synthetic butadiene market was valued at over USD 15 billion in 2016 and is expected to reach USD 20 billion in 2024, attaining a CAGR of over 4% during the forecast period. However, due to changing regulatory trends, there is shift in the market as government is encouraging use of bio-based product over synthetic to attain sustainability. Synthetic butadiene is highly volatile and exhibit lower water solubility and therefore has the tendency to evaporate easily, which is likely to pose serious threat to environment and human. Stringent regulations imposed by government created growth avenues for bio-based butadiene market size across various industrial applications. In terms of revenue, bio-based butadiene market size was close to USD 450 million in 2016 and is projected to expand at over 13% during the forecast period. Butadiene rubber was valued more than USD 5 billion in 2016. It is chiefly used in manufacturing automotive tires owing to its ability to offers various value added advantage such as better grip and low rolling resistance making it desirable in the automotive industry. Thus, increasing automotive sales across the globe will boost the synthetic & bio-based butadiene market size by 2024. SB latex butadiene finds widespread applications in building and construction for sealing and binding applications as it provides better durability, increased flexibility and reduced shrinkage. Furthermore, synthetic & bio-based butadiene market size for SB latex will exhibit growth more than 3% over the forecast timespan. It is also used in waterproofing system owing to value adding advantages including bond strength, reduces shrinkage and flexibility which will drive the global synthetic & bio-based butadiene market size by 2024. Asia Pacific led the overall synthetic & bio-based butadiene market size and accounted for a major chunk of the total market size in 2016, as key automobile manufacturers are based in China which drives the product demand in the region. Domestic product demand has increased due to increasing disposable income of consumers. The automotive production in China was over 23 million units in 2016. Additionally, Asia Pacific accounted for over 45% share of the global production in 2016, which signifies ample industry growth opportunities in the region. China is inclined towards plastic use for manufacturing automotive parts to reduce the overall weight of the car and improve fuel efficiency. For example, ABS are extensively utilized in manufacturing automobile parts. In terms of revenue, China ABS synthetic and bio-based butadiene market size was over USD 740 million in 2016. Rise in automobile production in China is expected to boost the ABS demand in Asia Pacific which will subsequently have a positive impact on the synthetic & bio-based butadiene market size by 2024. Synthetic & bio-based butadiene market size was fragmented in 2016 with major industry share contributors accounting for less than 30% of the overall share. Key companies in the business are BASF SE, Eni S.p.A, Evonik Industries AG, Exxon Mobil, INEOS Group, LyondellBasell Industries N.V., Royal Dutch Shell Plc, The Dow Chemical Company, PCS, Repsol, SABIC, TPC Group and Yeochun NCC. Major product manufacturers are in the long-term procurement contract with the end-user industries such as automobile, construction, etc. as the industry requires bulk use of product for manufacturing tires, automotive parts, water proofing system, etc. This helps the company in attaining better market presence across the industry ecosystem. Few major manufacturers including BASF SE and Royal Dutch Shell plc have presence across the multiple stages of industry ecosystem which helps them in accomplishing competitive advantage in the business. Furthermore, the product manufacturers are investing in R&D activities to develop bio-based butadiene products which will eventually help in attaining promising future growth opportunities. Synthetic & bio-based butadiene market has applications across various end-user industries including automotive, construction, etc., as it possesses various advantages including high impact and chemical resistance, toughness, heat stability, rigidity, and ease of processing. 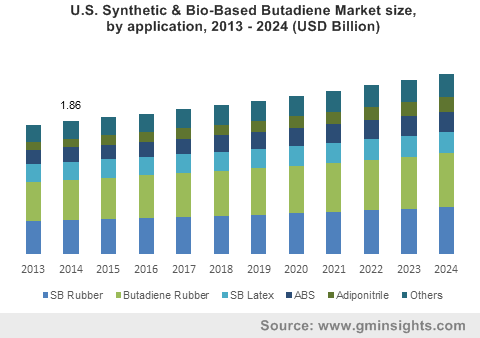 Thus, increasing automotive industry across the globe will positively influence the synthetic & bio-based butadiene market size during the forecast period. In addition, rapid industrialization and urbanization primarily in Asia Pacific will result in increasing construction industry and will subsequently help the synthetic & bio-based butadiene market size by 2024. Synthetic butadiene led the overall industry in 2016 on account of its widespread applications. Stringent government regulations have shifted the market focus to bio-based butadiene use which is expected to drive the segment by 2024.